I almost don’t know where to start with this review, perhaps my expectation is the best jumping off point; I wasn’t expecting to be that interested in this book in all honesty. For all of the legacy that Rotting Christ possess and having enjoyed various albums (most notably their early works), they’re a band that are never really on my radar. 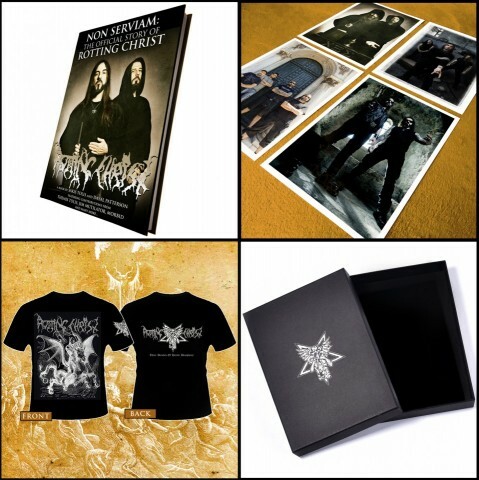 That being said this book, "Non Serviam: The Official Story Of Rotting Christ", has ignited in me a passion for this band that I didn’t expect to be dormant in me. 'Cinema Verite' is a style that has become more and more common within documentaries and this is perhaps the first book that has ever captured the raw and 'fly on the wall' feel that the best documentaries do, as such it is 'Biblio Verite'. 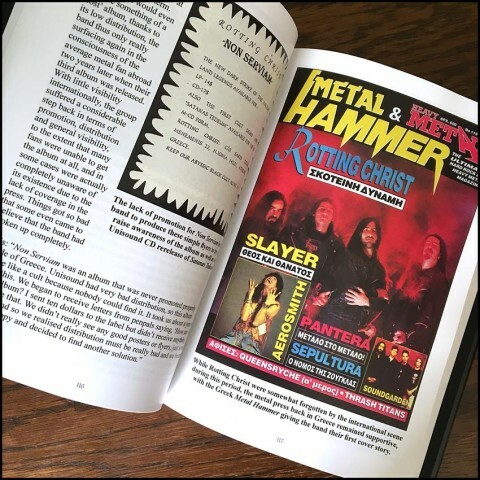 The easiest explanation for the book is that it sits somewhere between the feel of such great metal documentaries as "Some Kind of Monster" and "Anvil". Equal parts a story exploring the humble beginnings and dedication that a band has to their craft, as well as documenting the struggles that they have faced, and still do; both internally and externally. The writing style is sublime and the deft hand of Dayal almost feels like as much as he is the mastermind behind the book, his influence is minimal, you sense his guiding hand through the book but in actuality, the main author is the band themselves and Sakis in particular. I was expecting a lot more narrative, but the writing style feels like Dayal has given the band talking points and from there the magic unfurls. 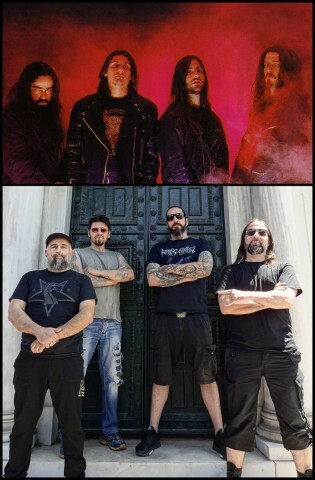 Chronologically ordered from the group’s childhoods up to their upcoming 2019 album "The Heretics", the depth and breadth of insight and opinion is staggering and yet it never feels like an inquisition, the structuring of the book means that each piece of commentary, be it from Sakis, Themis, Morbid or even Jim (who’s never spoken publicly about the band before) seems natural. One imagines a situation of friends sitting around reminiscing about their past opinions, challenges, and merits instead of pointed questions asked to different individuals in isolation. Chaptered mostly along the lines of the band’s releases, you really get an opportunity to understand the thought process behind each effort, their reflections on it and the misadventures that happened alongside it, not just historically but philosophically, emotionally and the conflicts that have peppered the members along the way. 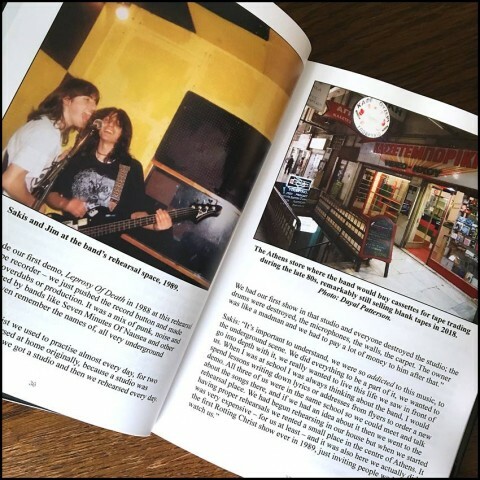 Stunningly captured amongst the interviews that feature numerous friends and other bands, are photos that chronicle the bands past, some of which are snapshots of a journey that few dares to tread. 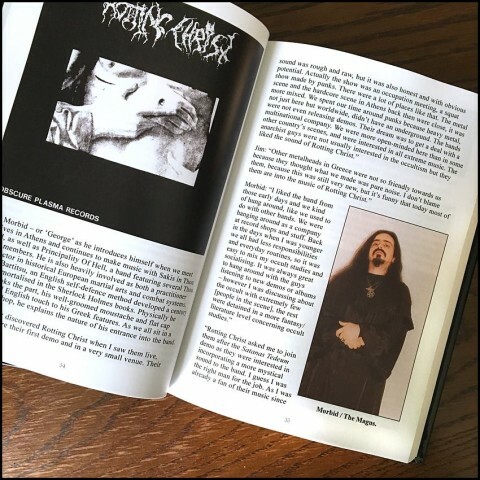 They provide a glimpse into the struggles and joys that Rotting Christ have experienced, and yet it never excludes the reader. 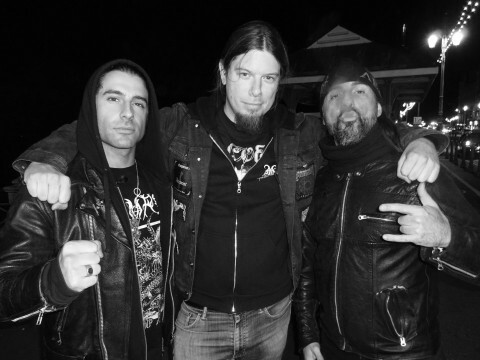 For those that are passionate about metal music in any capacity the story that is documented will surely resonate within. Particularly pleasing is the way the book is formatted; I expected (like most books) to find the pictures collected in various 'image sections' a couple of times through the book. Not so. The picture content is incorporated on nearly every page, providing not only a narrative of text but also the images to punctuate those eras. Included also, is the details of each release: track listing, performance, and production credits and where needed translations for song titles — a nice touch which lays the framework for each subsequent chapter. My version is the paperback one which includes black and white photos on nice glossy pages, the hardback version images I’ve seen (with color photos) look magnificent, and will surely be a must-have for die-hard fans of the band. My hat goes off to Dayal and the team at Cult Never Dies for being able to take what must have been reams of content, and have managed to whittle and edit it down to a story that is consistently engaging, coherent and never exploitary. It may be a 'warts and all' story but each negative is balanced by the band’s own opinion, and whilst Dayal may offer a few comments here and there, it never feels forced. Stepping away from it, it rejuvenated in me a passion for music and perfectly captures the fascination, dedication, and single-mindedness of an artist. There are many that attempt to be musicians, people wanting to make a living from music and be recognized for their technical merits, what is unveiled through "Non Serviam" is Sakis’ desire, regardless of prosperity or acclaim, to create because there is no other path or desire. 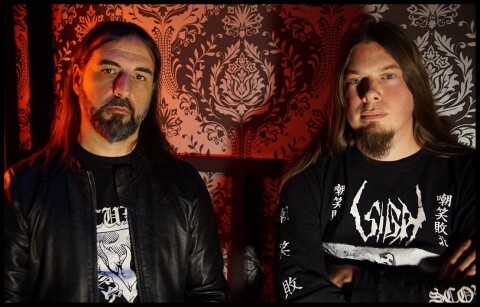 His one desire being to create music for Rotting Christ whether that be relished or disparaged by the listeners, critics or even his bandmates. This is a book that I struggled to put down and documents a story that needs to be told. 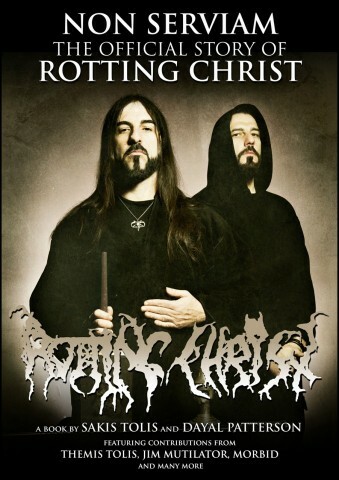 Anyway… enough ramblings, I’m off to work my way back through all of Rotting Christ’s back catalog, perhaps with the information I’ve gleaned, I’ll appreciate each album a bit more. 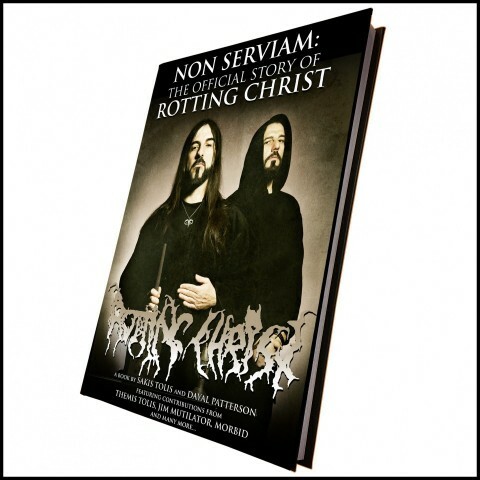 Noizr: "Non Serviam: The Official Story Of Rotting Christ" is now available for order via Cult Never Dies. Follow the project's page on Facebook. "Non Serviam" was released November 30, 2018. It's available in standalone paperback format and as a signed box set including a color hardback edition of the book, embossed box, exclusive shirt, a 12 piece set of 350 gsm art prints, certificate of authenticity signed by Sakis and Themis Tolis and one more special item.